At Lawyer Legion we recognize the importance of board certification programs in criminal law. These programs provide a powerful tool when the public begins their search for a criminal defense attorney in California. For this reason, we give special recognition in our online attorney directory to attorneys that have earned the designation as a certified specialist in criminal law. 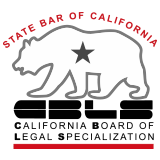 Use our directory to find California attorneys board certified in criminal law by the State Bar of California Board of Legal Specialization. be favorably evaluated by other attorneys and judges familiar with the attorney's work in the field of criminal law. Attorneys in both private practice and in the public sector can seek certification. Board certified attorneys in criminal law work at every level of the criminal justice system including as private criminal defense attorneys, public defenders, or as prosecutors. Prosecutors in California work at the state level (in the Attorney General's Office) at the county level (in the District Attorney's Office) or at the local level as a City Attorney. Federal prosecutors work in the various divisions of the United States Attorneys' Office. For purposes of the certification program, the term "criminal law" is defined to include both the defense and prosecution of persons accused of crimes in federal and state court, and minor children subject to wardship proceedings in juvenile court based on allegations of their criminal misconduct. The definition of criminal law also includes both trial and appellate advocacy, and other ancillary proceedings such as civil and criminal forfeiture proceedings. The standards for certification in criminal law should be read in conjunction with the rules Rules Governing the State Bar of California Program for Certifying Legal Specialists. Requirements for certification generally include a showing of criminal trial practice task requirements. The showing of substantial involvement in the practice area of criminal defense relates to the five years prior to submitting the application. Other showings that amount to a substantial equivalent of the criminal law practice task requirements. The attorney must meet certain educational requirements for certification within the three years prior to application for topics related to criminal law which can include substantive criminal law and procedure; writs, appeals and ancillary proceedings; evidence; and trial advocacy. The attorney must also submit to independent inquiry and review requirements for certification. Requirements include recommendations from lawyers, judges, co-counsel and opposing counsel. In addition to the CBLS, the National Board of Legal Specialty Certification also designates attorneys as specialist in Criminal Trial Advocacy. Although CBLS does not currently have a legal specialty designation for DUI law, the National College of DUI Defense has been accredited by the American Bar Association to designate attorneys as board certified specialist in DUI Defense. For individuals charged with a felony or misdemeanor crime in either state or federal court the search for a criminal defense attorney in California can be a daunting task. At Lawyer Legion we make that task easier by properly recognizing board certified attorneys. This article was last updated on Friday, February 19, 2016.